Leeds United fans that followed the club through the mid to late 1980s, continuously saw one name linked with a move to Elland Road. It was almost a weekly event that the journalists would sharpen their pencils to report news of Billy Bremner’s ‘interest’ in Bradford City's scottish winger John Hendrie. Hendrie was born in Lennoxtown,Scotland in October 1963 and joined Coventry City as an apprentice in June 1980 before turning professional within 12 months. After a short loan spell at Hereford United, John signed for Bradford in 1984 and played a key role the following season as The Bantams won the old Third Division title. John was a consistent performer season after season and his performances were not going unnoticed. “There was interest from Leeds United and when Trevor Cherry left Bradford he informed me that Billy Bremner wanted me desperately. However, Terry Dolan came in and I genuinely believed that, with a bit of investment, we had a chance of winning promotion to the top flight. “Terry played me through the middle and I thoroughly enjoyed that role. At the end of the season I had won the clubs player of the year award, my contract was up, but I decided to stay. The following season, City missed out in the play offs for a place in the old First Division." “They were skint and didn’t have too many players they could sell for a decent amount of cash. The two they had were Dave Beasant and myself. Dave joined Chelsea and I moved to Leeds United. “I soon realised that there was a massive expectation surrounding the club. 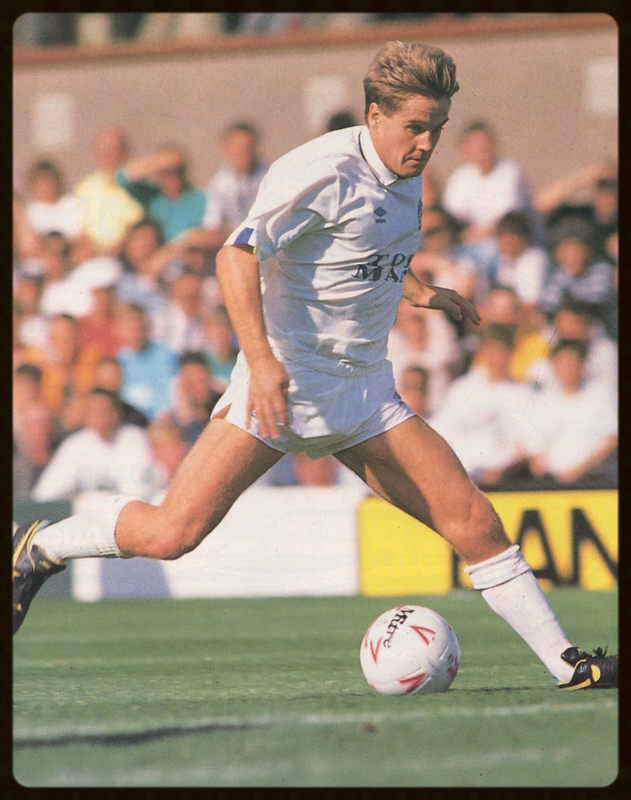 Howard Wilkinson had brought in some top drawer signings the previous season in Chris Fairclough and Gordon Strachan and he continued to spend during the summer of 1989. “Ironically, I made my Leeds United debut at St James Park against Newcastle. We were 2-1 up but their winger John Gallacher and centre forward Micky Quinn ran riot in the second half. “The atmosphere that night was electric and we got off to a perfect start with a Bobby Davison goal and I flashed a volley just over the bar. “I’ll never forget Vinnie (Jones) coming on for his debut. With the scores level at 1-1, Vinnie entered the field of play like Hulk Hogan. He was pumped up and got us and the crowd going. “As the clock ticked down Vinnie played the worst through ball ever and Gary Parkinson attempted to play the ball back to the keeper. However, the ball hit a divot and bounced into the back of the net. John was out until the middle of December due to complications with the injury. “I picked up an infection and I was rushed into hospital. I needed an operation to remove the infection, which left a huge hole in my leg. The medics were unable to stitch it up and they had to pack it from the inside. The District Nurse came in three times a day and I had to wait for the flesh to grow from the inside to the outside. “I’d hardly played any reserve team football but Wilko decided to throw me straight in. I enjoyed the goal and the victory but it’s fair to say that adrenalin got me through a few games. Leeds suffered (not for the first or last time) a sticky spell over the festive period, drawing two and losing one of the three games. It was almost two defeats but a late John Hendrie goal rescued a point against Oldham Athletic on New Years Day. “Those 45 minutes were probably the best I performed in a Leeds shirt. I had their full-back, Jimmy Phillips, on toast and I was quick to remind him of that afternoon when we ended up as team mates at Middlesbrough! “I was a substitute that night at Sunderland and it will live long in the memory. Only a handful of Leeds fans were allowed in the ground and it was a very intimidating atmosphere. Being an ex-Newcastle player, the Sunderland fans absolutely slaughtered me and whilst I was warming up, one of their supporters had a ‘pop’ at me. “I had a problem with my knee and I had been getting through it with steroid injections. Those injections, which are a last resort these days, were commonplace back then, and now many an ex-player suffers with major problems as a result and you certainly don’t have them just for the sake of it. “Wilko’s comments were bang out of order. I looked on it as a slur on my character. The pain in my knee came when I kicked a football and as soon as I joined Middlesbrough, the club doctor told me that I had a cyst on my knee, a pocket of fluid. I was educated on how to deal with the problem. “I had two years left on my contract and was raring to have another crack at the top flight. I was desperate to hit the ground running and returned to training three weeks ahead of schedule and all the other players, who were on holiday, to do extra fitness work in readiness for the new campaign. “After leaving Elland Road one day, after voluntary extra training with the physio, I returned home and my wife, who had gone out, had left me a note on the kitchen table asking me to call Colin Todd at Middlesbrough. “To my amazement, Colin told me that he’d agreed a fee with Leeds United and he asked me to travel up there for talks. “I was astonished, not one member of staff had the decency to inform me of the situation. I thought it was terrible man management and really I felt had no alternative but to leave Leeds United and go somewhere that I was wanted. “Neil has got them playing for one another and it looks like everyone knows their job and what is expected of them,they trust the system and are starting to believe in themselves. Thank you to John Hendrie for his time and giving me the opportunity to write this article.